Click on picture to see a larger view. 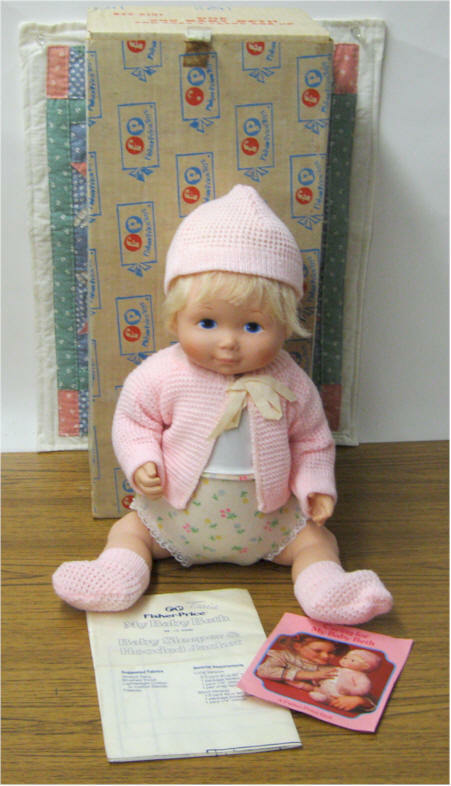 VERY RARE No 248 Fisher Price Baby Ann and Her Care Set. 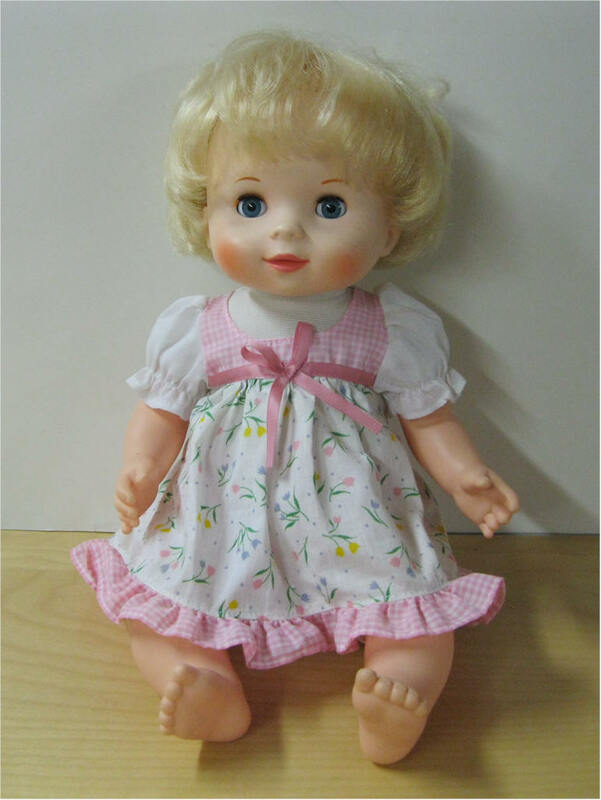 7-piece set with machine washable, dryer safe doll and washable accessories. 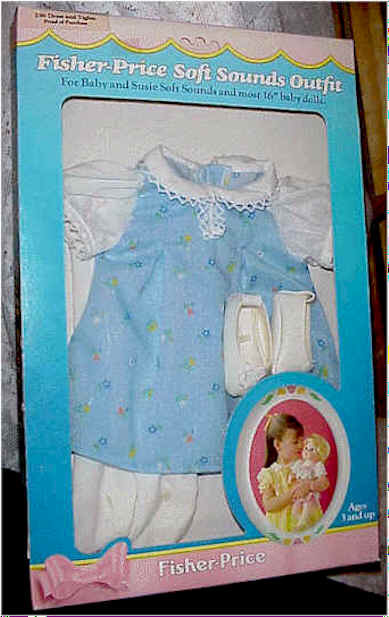 Includes: Nightgown, infant seat has retractable stand, 3 piece feeding set, and copy of pattern Still attached to box. Never played with. 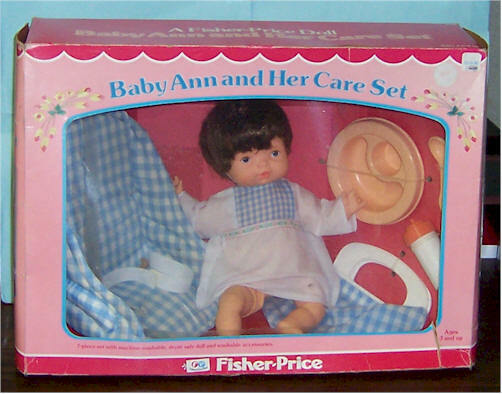 No 248 Fisher Price Baby Ann and Her Care Set. 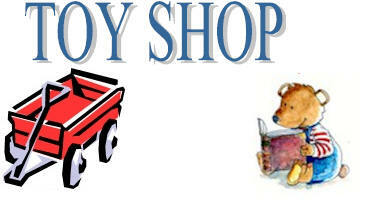 7-piece set with machine washable, dryer safe doll and washable accessories. 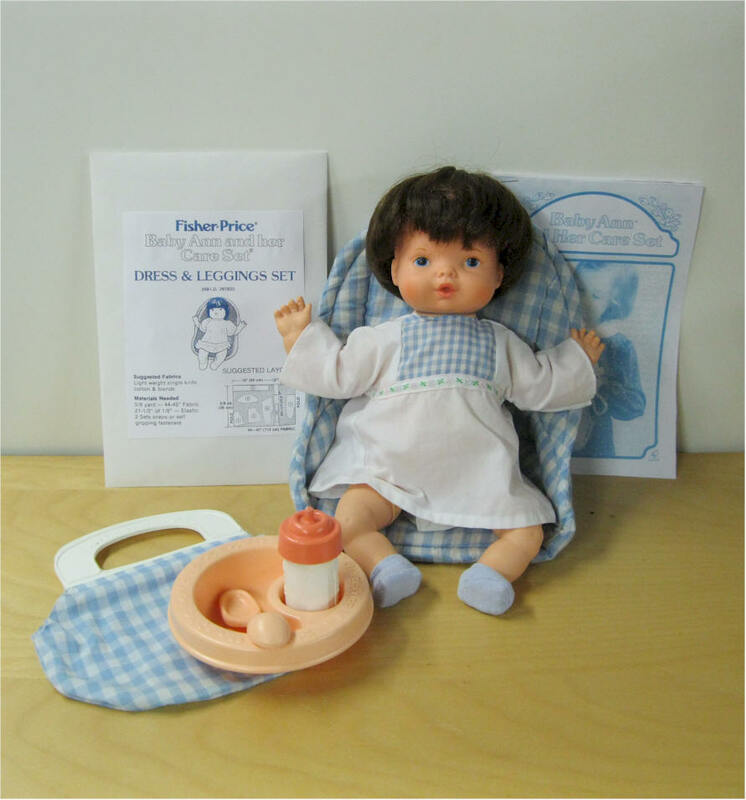 Includes: Nightgown, infant seat has retractable stand, Carry bag for her bottle and spoon, COPY of Caring instructions and pattern Very clean. 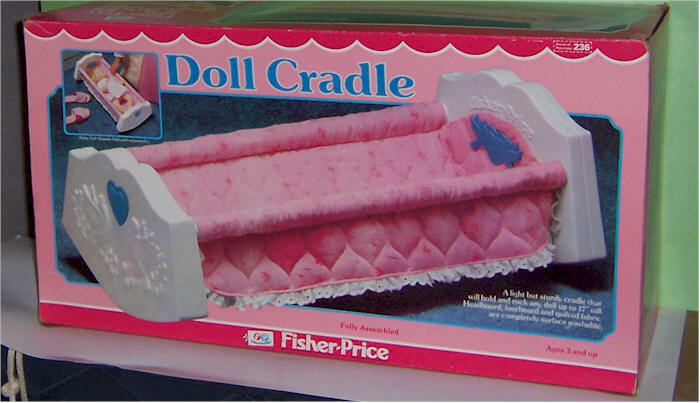 1981 Fisher Price Doll Cradle for Suzie Soft Sounds or Baby Soft Sounds or any doll. Mint in Box. Soft quilted pink fabric of tricot backed polyester cotton blends. Never used . Mint condition. No. 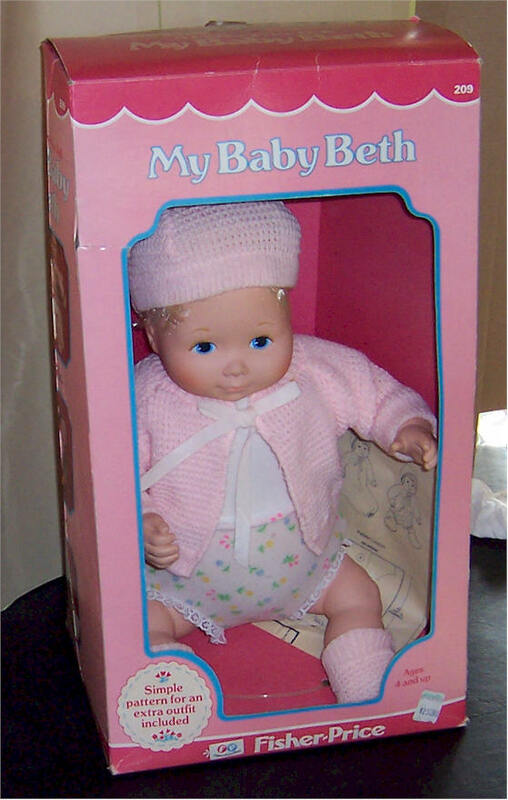 209 Fisher Price My Baby Beth. Soft, loose-limbed body with unique design which enables her to sit up without toppling over. Dressed in permanently attached T-shirt and ruffled print pants. Comes with original sweater,booties and hat. Pattern. Couple of small stains on back of legs. Still in mint condition. No. 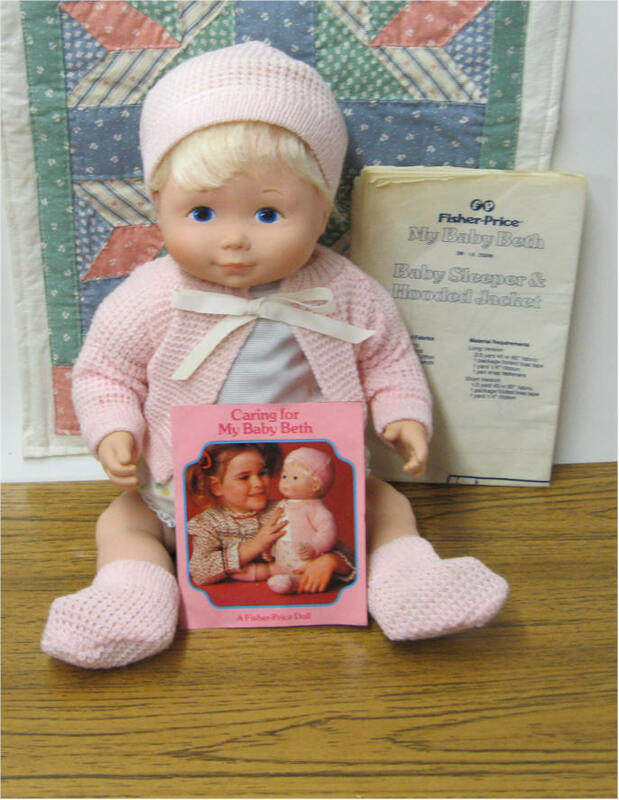 209 Fisher Price My Baby Beth. Soft, loose-limbed body with unique design which enables her to sit up without toppling over. Dressed in permanently attached T-shirt and ruffled print pants. Comes with original sweater,booties and hat. Pattern. Excellent condition. Comes in mail away box. No. 201 - 1982. 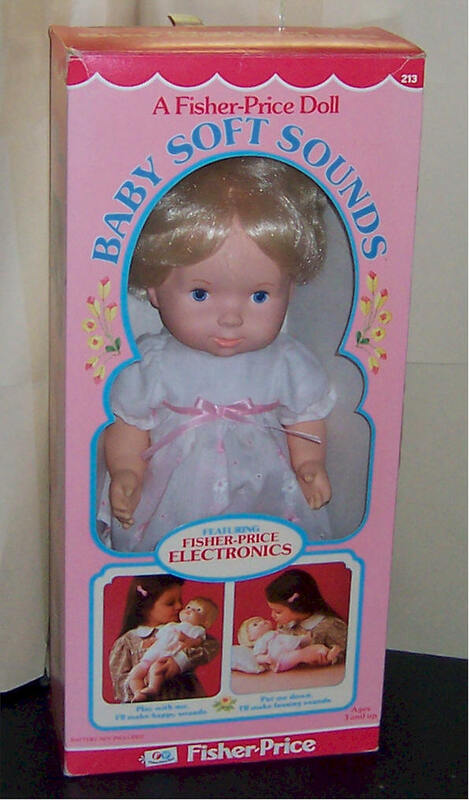 Fisher Price Susie Baby Soft Sounds with sleep eyes. She comes with a electronic "voice box". Requires one 9-volt battery. 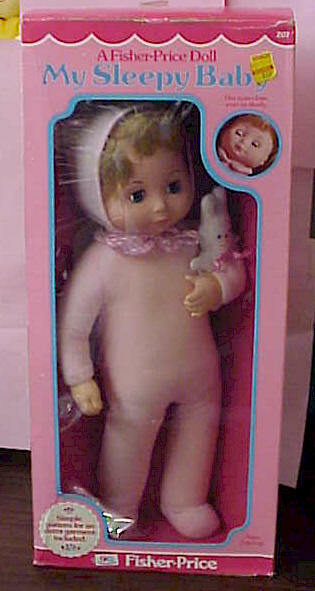 Soft, huggable foam filled body, vinyl arms, legs and head with silky rooted hair. Dress is original. Very Clean. Works great. No. 213 - 1979. Fisher Price Baby Soft Sounds. She comes with a electronic "voice box". Requires one 9-volt battery. 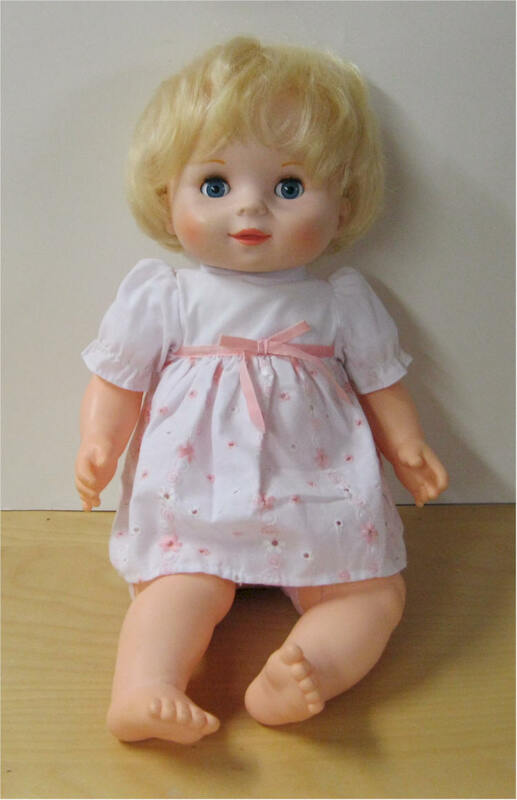 Soft, huggable foam filled body, vinyl arms, legs and head with silky rooted hair. Dress is original. Very Clean. Works great. No. 213 - 1979. Fisher Price Baby Soft Sounds. She comes with a electronic "voice box". Requires one 9-volt battery. Soft, huggable foam filled body, vinyl arms, legs and head with silky rooted hair. Dress is original. Wearing booties. MINT condition Works great. No. 201 - 1982. 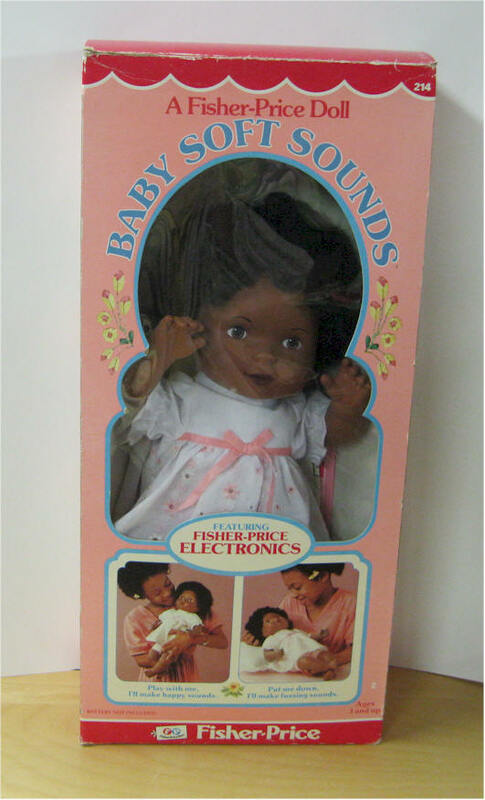 Fisher Price Susie Baby Soft Sounds MIB. 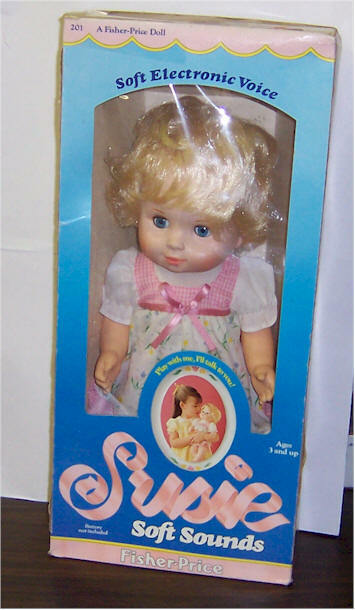 Includes: Doll, Care instructions. Never played with. Original box. No. 213 - 1979. Fisher Price Baby Soft Sounds. Original box. 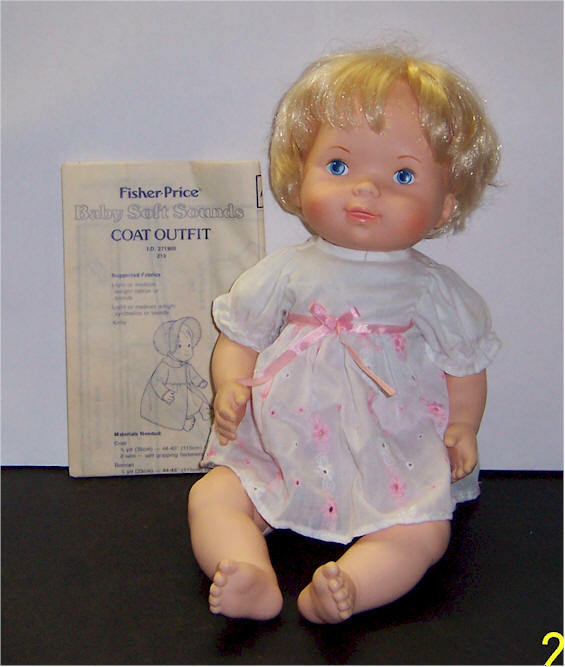 Includes: Doll, pattern for coat, and Care instructions. 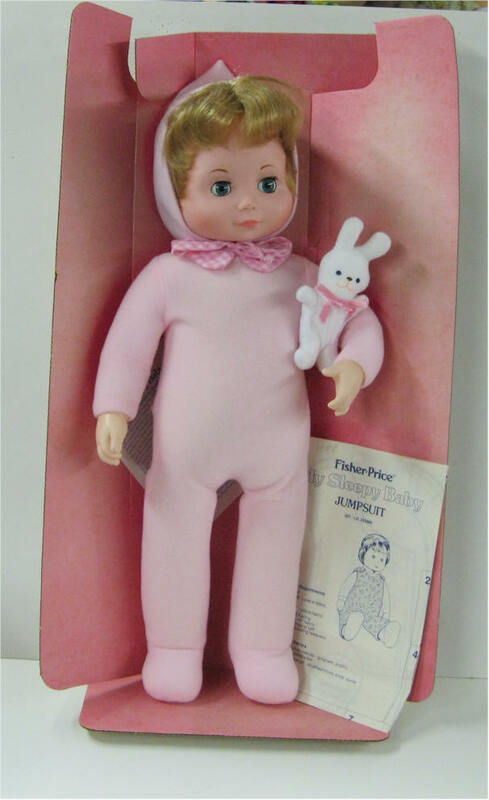 MIB - Fisher Price Soft Sounds outfit. Dress and Tights. Light blue printed dress with pleaded bodice and white tights and shoes. MIB - Fisher Price Soft Sounds outfit. Knit Legging Set. 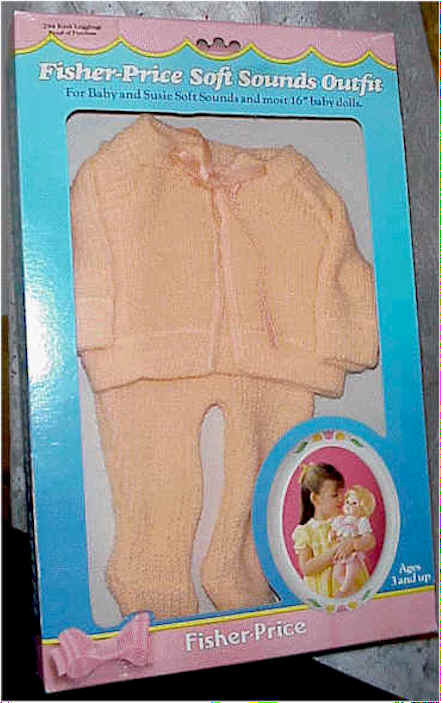 Sweater and leggings knitted in peach colored acrylic yarn. MIB - Fisher Price Soft Sounds outfit. Playtime Overall Outfit. Yellow and white polka dotted. Front bib overalls with easy-fastener straps and coordinated. 19" My Sleepy Baby. #207 1979-1980 MIB. 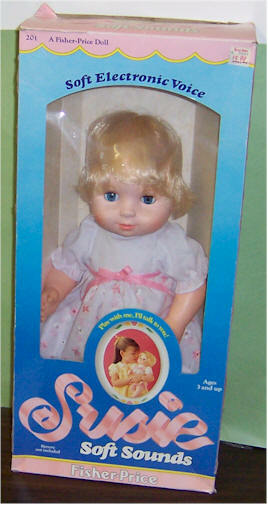 A soft doll with blonde rooted hair and eyes that open and close. Vinyl head and hands, and a foam body, she comes dressed in a permanently-attached pink sleeper. Bunny playmate attached to her arm with elastic. Comes with pattern for outfit and cleaning instructions.